Thai flavors...love them! Tacos...love them! 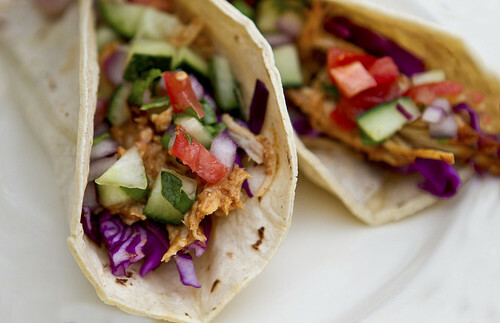 Slow cooker meals...love them! So, yeah, I was pretty sure I would love these when I tried them. And I did! I also ate the leftovers for lunch the next 2 days and still loved them just as much. This recipe was in the latest issue of Clean Eating and they are definitely worth a try! 1. Place chicken in slow cooker. In a blender, combine broth, garlic, 1 T lime juice, peanut butter, soy sauce, ginger, curry paste, and 2 packets stevia; blend until smooth. Pour over top of chicken and stir gently to coat. Cover and cook on low for 6-7 hours, until chicken is tender. 2. Stir and increase heat to high. With a slotted spoon, remove chicken and transfer to a cutting board; set aside until cool enough to handle. Remove 1/2 c broth mixture from the slow cooker and transfer to a small bowl. Add coconut flour to bowl and stir to form a smooth paste. Return broth=flour mixture to slow cooker and whisk until smooth; cover. 4. Using 2 forks, shred chicken and return to slow cooker; stir to coat. Cook for 10 minutes, until heated through. 5. Meanwhile, in a medium bowl, combine tomato, cucumber, onion and mint. Add vinegar, remaining 1 T lime juice and 1 packet stevia; mix thoroughly. To assemble, spoon cabbage, chicken and tomato-cucumber mixture into center of each tortilla, diving evenly. Marci- I love your menu blog! It's so awesome! This recipe looks amazing. Going to try it this week. Yum! Those look amazing ! Since I just so happen to be the recipe developer for that feature... I'm so happy to come across this post! I'm very happy you liked this recipe. And what pretty pictures, too!